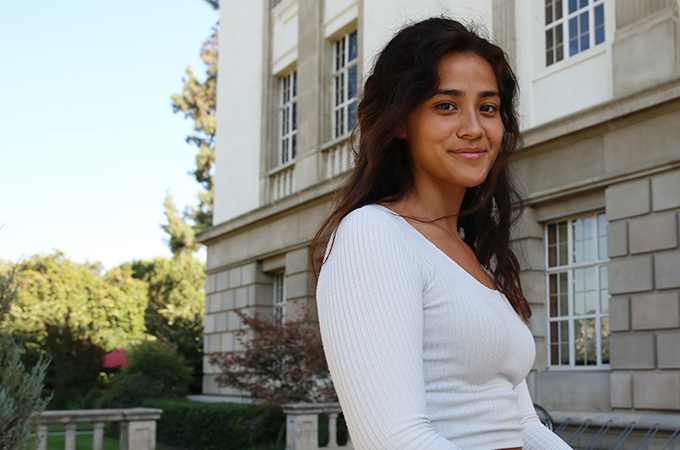 After growing up in Ewa Beach, Hawaii, where she attended a high school with small classes, Destiny Ng ’20 knew she wanted a college experience that included real interaction with her professors. When she visited the University of Redlands, she knew it was the right fit. Since she declared her major, Ng has enrolled in literature classes that have spanned a variety of topics. During a May Term course, she studied James Baldwin with Professor Sheila Lloyd and got to know Professor Anne Cavender, who fueled her passion to learn and teach. In addition to her studies, Ng joined the Kappa Pi Zeta sorority, which she says has been a highlight of her time on campus. As the only environmentally focused sorority, the group made Ng feel more connected with her Native Hawaiian roots and has routinely sponsored environmentally themed events, including inviting National Geographic photographer Cristina Mittermeier to campus to talk about her work. Another high point that connected Ng to her culture was receiving the San Manuel Band of Mission Indians Excellence in Leadership Scholarship. The scholarship, which is given to selected Native American, Alaska Native, and Native Hawaiian students, is awarded to those who are leaders and advocates in their Native communities. After a college counselor discouraged Ng from applying for the scholarship because she is a Native Hawaiian instead of Native American, she took matters into her own hands and submitted an application. “People in the Native community often don’t have the opportunity to go to college,” she says. “Receiving the San Manuel scholarship made me feel more connected to my heritage as a Native Hawaiian."